So often we go to the movies to escape reality: enter into fictional worlds of international intrigue with James Bond, dystopian action with Mad Max, and intergalactic travel with James T. Kirk and Spock. But every now and again, a movie comes along that forces us to confront the world and all of its flaws head-on. This is one such movie. I reviewed the book Room by Emma Donohue back in September after returning from my trip to Paris. The fact that I was able to finish reading this book on a plane with babies screaming, an elderly man snoring, and this sick kid across the aisle sniffing every five seconds speaks volumes about the immersive quality of this novel. When I found out that a movie adaptation was to be released, I was skeptical, as I know many fellow bookworms probably were. The common assumption is that the movie adaptation will not do the book justice, and will leave out crucial details, shatter peoples’ mental images of the characters, or even change the entire direction of the plot in some cases. But this movie did none of those things, probably because Emma Donohue wrote the screenplay. I love when authors do that. 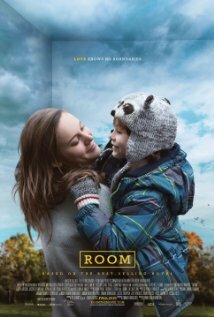 This movie adaptation brilliantly captured the raw emotions of Jack and Ma invoked by their solitary life in Room, while also honing in on the beautiful naivety of Jack and the world seen through his eyes. The actors selected to play Jack and Ma were near-perfect selections. In many cases, I find there is a bothersome juxtaposition between actors and the roles they play. It’s like if Justin Bieber was picked to play Mr. Knightley in a movie adaptation of Jane Austen’s Emma. It’s just not what you picture. In this movie, however, the actors were talented but unembellished, which allowed me to focus entirely on the adaptation of the story, and the elements used to propel the plot forward. This film is startlingly real, yet its dark and disturbing themes were gracefully adapted. Plus, the unique shift in perspective to that of a young child who believes that his life in an 11x11ft garden shed is as normal as anyone else’s makes the story all the more powerful, and all the more heartbreaking. Admittedly, I cried during several scenes because it is difficult to think about life in such an environment, and equally more difficult to think about the courage required to even consider escaping. While society tends to filter what we see to only include things it thinks we will enjoy, this movie is one that needs to be seen, and what it represents needs to be talked about. I would highly recommend this movie to everyone, to people who have read the book, to people who haven’t, and to people who still have doubts about the value of a movie adaptation of a novel.